In the last issue, Wade wrote about his reloading experiences for an old Harrington and Richardson top-break revolver chambered for the .32 S&W Long cartridge. At the range at one of our shoots, he was talking to Gerhard about it, and I caught snippets of the conversation over my shoulder. I wasn’t sure what he was talking about, but it sure sounded like he was talking about something very similar to something that I had at home. Like Wade, this old Iver Johnson top-break revolver came into my possession because I am the certified family gun nut. It belonged to my wife’s grandfather and when he passed, it and some other firearms came to stay with me for awhile as they continue their trip through time. It came to me with about a half-box of Remington .32 S&W (short) ammo. After shooting through that ammo (very weak, felt just a little more powerful than a cap gun! ), I put the gun in my safe and didn’t think much more about it for a couple of years. That is, until I overheard Wade’s conversation at the range. That caused me to pull it out of my safe and take another look at it. When I did, I noticed that I had not cleaned it after I put it away when I shot it. I had no idea whether it came to me in cleaned condition or not. I hadn’t paid it that much attention. I didn’t know much about it, but I did know that it was an old inexpensive pocket revolver that was made in the millions, and was originally available for purchase down at your local hardware store. But it still deserved to be taken care of, right? So I commenced to give it a good cleaning. There was a lot of firing residue built up in the area of the barrel-to-cylinder interface. Now how do I get in there to clean? After a little fiddling around, I found that after the revolver was broken open, all I had to do was pull back on the cylinder while spinning it counter-clockwise. This allowed it to be pulled off of the central cylinder pin under the bore which is affixed to the tilt-down barrel assembly. With the cylinder separated from the rest of the gun, I was able to give the gun a good scrubbing. As I examined the piece, I found that overall, it was in very good condition. I had no idea of the age of the gun. It is nickel plated, and the only area where the nickel was pitted is under the top strap. This was revealed once all the firing residue was removed to allow me to see what was under it. So after it was clean, it just sat on my desk for several weeks where I used it as a fondle-toy while working on my computer. With the hammer down, the cylinder spins freely in the clockwise direction. It only locks up (loosely) when the hammer is back, both in single action and double action modes. That’s the nature of the beast. The trigger pull, both in single and double action mode is very heavy. The action incorporates a transfer bar safety. 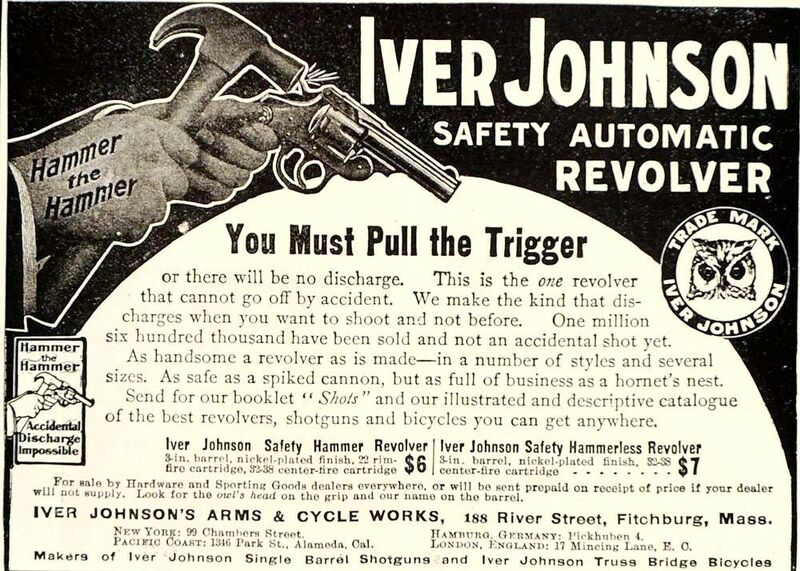 Stamped into the top of the barrel is, “IVER JOHNSON ARMS AND CYCLE WORKS, FITCHBURG MASS. U.S.A.” on one line. Below that on a second line is, “PAT’D APR 8 86 FEB 15 87 MAY 10 87 DEC 26 93. PAT’S PENDING”. Well how old is this gun? My original guess, judging by condition, was that it may have been made sometime mid-century, perhaps as late as the ‘50s. When I started researching, I found out that it was much older than I had thought. The internet is a wonderful tool. How did we ever get along without it? By comparing descriptions of the features of Iver Johnson top break revolvers over their production lifetimes, I learned that mine is one of the earliest made. It is a first model Safety Hammer Automatic Revolver. First models were made from 1894 to 1896. Mine was probably made in ’95 or ’96 judging by the description of how the cylinders were retained. Mine is definitely a first model, but it has the screw-on, screw-off cylinder retention system which was introduced later in the first model run. 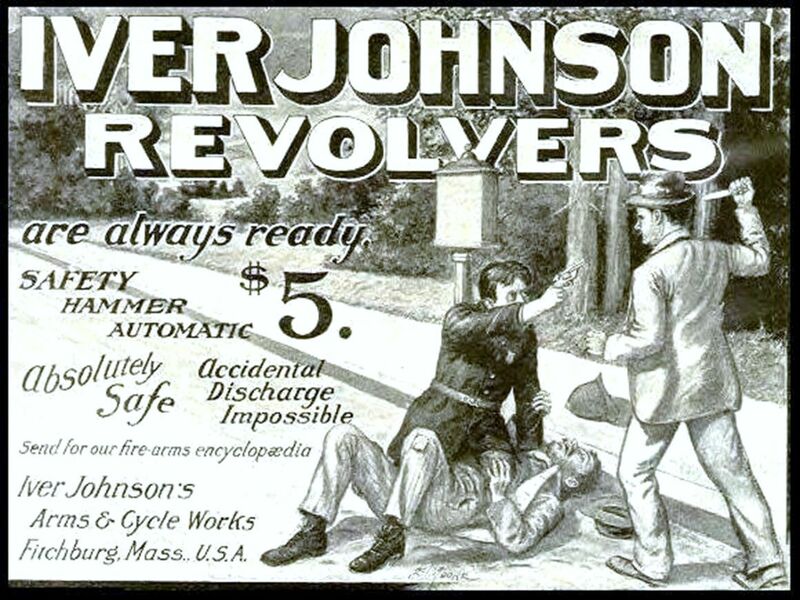 The term, “Automatic Revolver” refers to the method of cartridge extraction. As you open the revolver, the barrel rotates, tilting the muzzle downward, and the central extractor star automatically rises to pull the cartridges out of the cylinder bores. My Iver Johnson is chambered for the oldest, the smallest, and the weakest of what is now a family of four .32 caliber revolver cartridges. The .32 Smith & Wesson cartridge was introduced in 1878 as a black powder cartridge. Both first model and second model Iver Johnson’s were designed for black powder. Third model revolvers were redesigned and strengthened to handle smokeless powder and were introduced in 1909. It is not recommended to fire first and second model Iver Johnsons with modern smokeless powder ammunition. I did, and with no apparent ill effects. But the warnings mention the possibility of breaking fragile leaf springs, and shooting the gun loose. It already seems pretty loose in the lockup. I have fired it, so now that my curiosity has been satisfied, I am perfectly content not to fire it again. It’s interesting to look at the old time ads mentioning prices of $5, $6, and $7. Today, this gun, in the very nice condition it is in, could fetch $250 from an interested buyer. But I have no plans to sell it, and with no plans to fire it, it will remain an interesting fondle-toy. 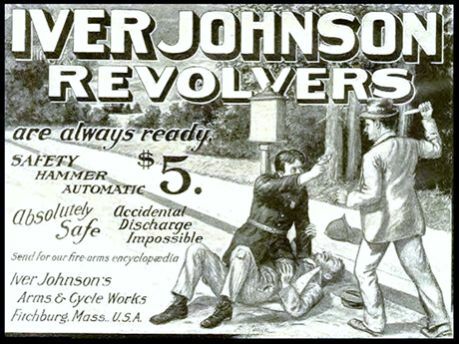 All this fondling and research of the little Iver Johnson got me thinking and learning about the .32 caliber revolver cartridge. I didn’t know much about the .32s. I just never had much reason to think about them before. I used to own a Colt Anaconda in .44 Magnum with a 4” barrel. When I bought it I envisioned it as a general purpose outdoorsman’s gun – something to have on me anytime I was in the woods. After all, you just never know when you’re going to be set upon by a cougar or a grizzly. Really? Come on. That’s the reason that I no longer own the Anaconda. It was a fine gun, but even with only 4” of barrel, it was a big heavy chunk of metal. To me, a trail gun is something that you wear on your hip all day just because. You really have no reason to shoot anything in particular, but if you happen to come across something that needs to be shot, your gun is there with you, ready to go. But the Anaconda was just too heavy to wear on the hip all day. It was constantly pulling my pants down. There are no grizzlies in Arizona that I need to worry about, anyway. The Anaconda spent way too much time in the safe and too little time on the trail to keep anymore. I presently own a .357 Taurus Tracker with a 6½” barrel. It is primarily a silhouette and hunting revolver for me. It can be used as a trail gun because with the longer barrel and friendlier caliber, it is easier to actually hit stuff. But that long barrel on your hip can also be a nuisance. That’s OK if I’m afield with the gun for a purpose, as my primary hunting arm for instance. But it just gets to be too much of a bother for anytime, every time carry in the field. What about autopistols? There are many polymer pistol options out there today that are light in weight and compact. But I have found no centerfire autopistol that compares in hit-ability to a quality revolver fired in single action mode. I’m talking about being able to hit something at typical extended handgun distances of 50 to 100 yards. Another huge advantage to revolvers is that you can load to a much wider spectrum of power. An autopistol is a one-trick pony. Load it down too far, and it won’t cycle. I had been thinking of getting a 4” .357. Now that would make for a very nice just because trail gun. I used a borrowed early 60’s 4” Colt Trooper in the last Handgun Hunter’s Challenge match earlier this year. The Trooper has adjustable sights which I consider essential in a woods gun. The early Trooper had an unshrouded ejector which made it lighter than the later models with the underlug shroud. I loved it, but I had to return it. So this is the soup in which my brain started stewing about the .32 caliber revolver cartridge. I’ve been looking for the perfect anytime, every time trail gun for many years now and just have not been able to figure out the perfect combination of hit-ability, carry-ability, and power level. A couple of years ago, I saw the magazine articles surrounding the introduction of the .327 Federal Magnum. After reading the articles once and filing the information into the back of my mind, no further CPU cycles were spent processing the info. The articles focused on the .327 FM as a lower recoil alternative to the .357 magnum for urban self defense. I don’t often worry about carry on the street, so this was a use that just didn’t catch my interest. The .327 Federal Magnum is the third and most powerful stretch of what started as the .32 S&W in 1878. The case length of the original .32 S&W is .610 inches. In 1896, this case was stretched to .920 inches to create the .32 S&W Long. Though there was a lot more room for powder, the Long was not a giant leap over the .32 S&W. Pressures were kept modest and velocities were only slightly faster. With a 98 grain lead round nose bullet flying at around 700 feet per second, the Long was no powerhouse. Today it seems hard to believe, but the .32 Long was a popular police handgun caliber at the turn of the 20th century. It also went on to fame as a popular target cartridge when loaded with hollow base wadcutters seated flush to the case rim. It took until 1984 for the next upgrade to come to the .32 caliber revolver cartridge. This was in the form of the .32 H&R Magnum. Federal teamed up with Harrington and Richardson to introduce this cartridge. The cartridge was stretched to 1.075 inches and the pressure limit was boosted to 21,000 CUP. This more than doubled the power level over the .32 S&W Long. In terms of kinetic energy, the .32 H&R closely matches the .38 Special. Revolvers chambered for the .32 H&R can safely chamber and fire the two earlier and milder S&W cartridges. Ruger worked alongside Federal to introduce the .327 Federal Magnum in 2008. The tried and true technique of stretching a pre-existing revolver cartridge and bumping up the pressure level was used yet again to bring the .32 caliber revolver cartridge into the modern magnum era. The .32 H&R was stretched an additional ⅛ inch to a case length of 1.200” to create the .327 Federal Magnum. Pressure was boosted to a breathtaking 45,000 psi. That’s higher pressure than both the .357 and .44 Magnums. The result is a .32 caliber cartridge that treads into the lower power realms of the .357 Magnum, but with more manageable recoil. It is considerably more powerful than the .38 Special +P. It rubs shoulders with the 9mm +P, .40 S&W, and .45 ACP in terms of kinetic energy. The first handgun offered on the market chambered for the .327 was the Ruger SP101. This is Ruger’s small frame double action revolver platform. It is a strong and chunky piece. As a .357, it is a five-shooter. But as a .327, one extra round is squeezed into the cylinder to make it an honest six-shooter. The .327 SP101 sports a rear sight that is adjustable for windage, but not for elevation. The front sight is fixed and it wears a three inch barrel. For citing ammunition velocity specs, this is considered the standard barrel length for the .327 Federal Magnum. Ruger has jumped in to the .327 market in a big way, now also offering the larger frame GP100 with a four inch barrel and a capacity of seven rounds; and the Blackhawk single action revolver with a 5½ inch barrel and a capacity of eight rounds. The Blackhawk would make a fine javelina hunter capable of getting 1600 fps out of the .327! Charter Arms and Taurus introduced some .327 Federal revolvers, but it appears that they have already decided to abandon the cartridge. They have discontinued their offerings and sold the remaining inventory at closeout. That brings us to Smith & Wesson. S&W offers two revolvers in .327 Federal. Both are made on S&W’s small revolver platform, the well regarded J-frame. 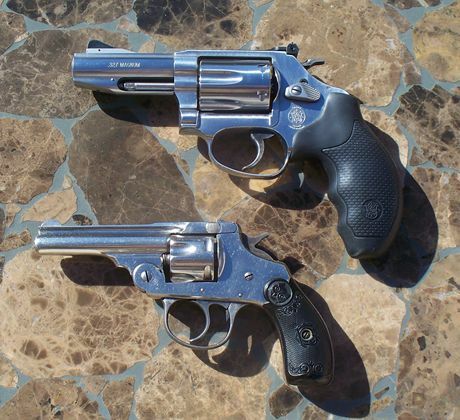 Both of S&W’s .327s are in their Pro Series of revolvers. The Pro Series is a product line which is a step up from their standard production models, but do not carry all the bells and whistles of the Performance Center revolvers. As the original intent of the .327 Federal was as a lower recoil alternative to the .357 Magnum for “social work”, S&W offers a double action only concealed carry revolver. It is built with a fully shrouded hammer, and a barrel length of 2⅛”. It carries fixed tritium night sights front and rear. S&W’s second .327 revolver is also ostensibly aimed at the self defense market, but it’s features to my mind, actually make more sense in an outdoorsman’s gun. The Model 632 Carry Comp Pro was introduced in early 2009. When I stumbled into this gun as I researched the world of .32 revolvers, I knew that I had found an excellent answer to what I had long been looking for. So what features set this gun apart as maybe the ultimate answer to my quest for a carry everywhere, carry all the time trail gun? First is small size and low weight. The S&W weighs only 24.5 ounces, compared to the Ruger at 28 ounces. A small difference to be sure, but a difference that helps carry-ability. There’s enough heft to moderate recoil, but not enough to pull down your pants. Carried in a high ride, canted pancake holster, it tucks in tight and almost disappears from thought. Just like the Ruger SP101, in .357 the S&W J-frame revolver is a five-shooter. But when chambered for the slimmer .32 caliber cartridge, it becomes a six-shooter. The Carry Comp Pro boasts a fully adjustable rear sight, a feature that I already mentioned that I consider mandatory in a field gun. With a three inch barrel like the SP101, the M632 barrel is short, but it is not a snub nose. But the last third of an inch of the S&W’s barrel is terminated with an expansion chamber and a port on top to reduce muzzle flip. This compromises sight radius slightly by moving the front sight back by that much. The Carry Comp Pro also has an exposed hammer, allowing single action fire for best hit-ability. Not inherent to the gun, but inherent to the caliber, is the wide performance spread available to you. Basically, a .327 Federal Magnum revolver can shoot loads that carry power levels from .22 LR equivalent, all the way up to .357 magnum - a very useful and versatile spread of power. What kind of targets of opportunity might arise while knocking about Arizona’s wild country? At the low end, discarded cans and plastic bottles. Moving up the critter spectrum, there’s cottontail, squirrels, jackrabbit, ringtail, gray fox, badger, bobcat, coyote, and javelina. Well some of these are not exactly targets of opportunity. Some have regulated open and closed seasons. But the point is that this little three inch defensive revolver has the accuracy to take squirrels and the power needed to cleanly harvest javelina. And yes, it has adequate power to be used for defense against a stalking cougar, and for calming potential two legged predators in the woods as well. There are downsides to the .327 Federal Mag though. The jury is still out regarding whether it will be a successful cartridge. There are many naysayers out there in gun-land who ask, “What question does it answer? What does it do that other long established cartridges don’t?” These are fair questions that only the market will be able to answer in the long run. Factory ammo for the .327 Federal Mag is limited but adequate. 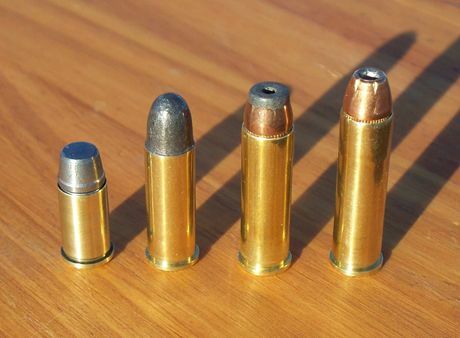 Handloading allows you to take full advantage of the possibilities of the cartridge. The selection of component bullets (actual diameter is .312”) is slim but again adequate. Useful weights are from 85 to 115 grains. Brass is not easy to come by. Federal has released only very small quantities of it to the reloading market. Starline is the only source of handloader’s .32 H&R brass today, and that’s what I used to begin my reloading trials for this gun. I lucked out when I saw a message on an internet forum that mentioned that Starline had just released its first run of .327 Federal brass, after many months of denying that they ever would. The choices were only 500 and 1000 case quantities. I procrastinated for a day before pulling the trigger on a 500 case lot. The next day, they had sold out with a notice that they would not produce another batch for several months. So it goes. But now I’ve got what I need to keep my S&W well fed for the foreseeable future. I assembled a number of different loads that well represented the power versatility of this new revolver chambering. I used Hornady .32 H&R dies which will also load .32 S&W Long as well as .327 Federal Mag loads. All you need to do is adjust seating and crimping depths. The original .32 S&W short is just too short for the dies. Test results are summarized in the accompanying table and charts. Distance for the group data was 15 yards off a sandbag that moved every time I fired. Loads in bold text are favorites that I will probably use on an ongoing basis. To test terminal effectiveness I shot at some water filled pop bottles and one gallon milk jugs. 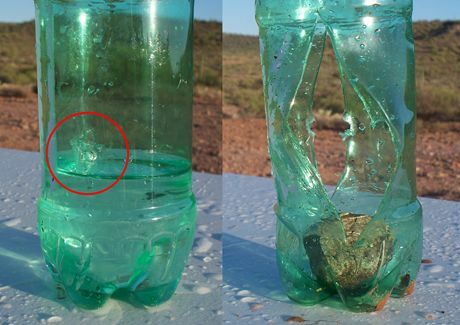 The photo of the two water-filled pop bottles should give you a good feel for the power spread. The bottle on the left was shot with the Prvi Partizan .32 S&W Long LRN load - a little hole going in and a little hole going out. The right bottle was shot with load #8 in the chart, a full power .327 FM handload using the 100 grain Hornady XTP bullet. Very effective and dramatic energy transfer from that load. 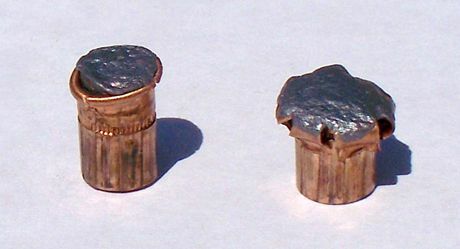 In the photo at right are two bullets recovered from the milk jug test. The milk jugs are six inches thick and were lined up next to each other to test depth of penetration. On the left is the 100 grain jacketed softpoint from the American Eagle .327 Federal factory load. It penetrated all the way through four jugs and was recovered at the bottom of the fifth jug. The slug expanded to a diameter of .370” and weighed 99.4 grains when recovered. On the right is load #8 again, firing the 100 grain Hornady XTP at around 1350 fps. It exhibits a classic mushroom, expanding to about .475” and weighing 95.4 grains after recovery. It plowed through four milk jugs as well, but did not penetrate into the fifth. It was found nestled between jugs 4 and 5. One thing I have not yet figured out is deciding which loads to pack with me while wandering the desert and forest. 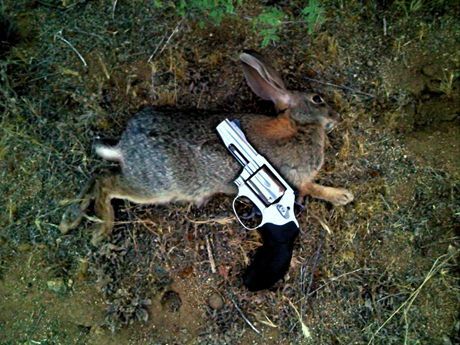 If you shoot a cottontail with load #8, all you might see is an explosion of fur settling to the ground. But you don’t want to have a .32 S&W Long indexed to fire when that mountain lion pounces on you either. I really like load #5. It is a .32 H&R that uses the 85 grain Hornady XTP. It’s comfortable to shoot and exhibited decent expansion in the pop bottle test. 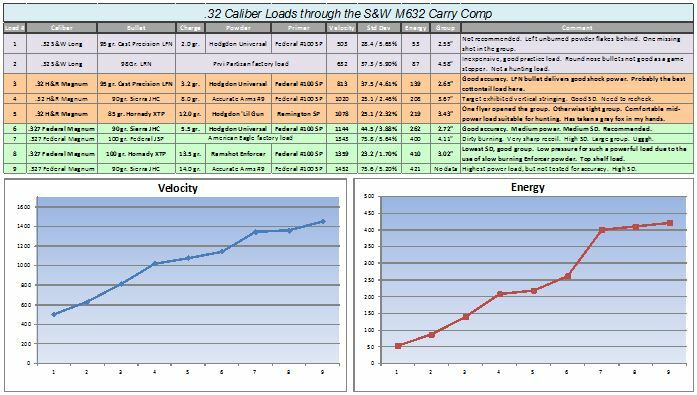 Is the S&W M632 Carry Comp Pro the answer for the perfect carry-always trail gun? Well for me, it’s darn close.